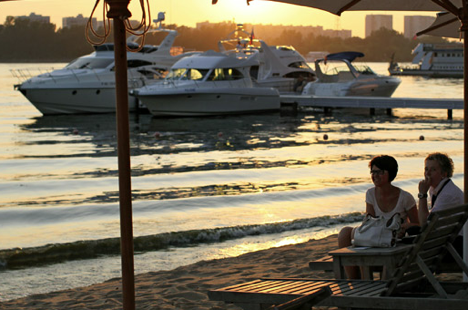 The Russian capital offers plenty of summer fun by the beach for those looking to escape the monsoon blues. Alas, Moscow is not on the ocean, and the lack of a nearby body of water is felt acutely in the summer. However, things are not as bad as they might seem at first glance. There are other places in Moscow where you can swim, but in those places you will not be able to escape the realities that come with relaxing on any public urban beach: a lack of deck chairs, neighbours who are not always pleasant, and masses of people. The addresses of all the beaches can be found here: http://pro-stranstva.ru/gde-kupatsya-v-moskve/ (map of the locations, in Russian). Rental: 90 roubles ($2.6)/min. ; 4 boats operate daily from 8 a.m. to the last customer. How to find it: Strogino Beach, Alye Parusa Wharf. Rental: 90 roubles/min. You can ride the powerful SupraLaunch 24SSV boat, which has the biggest wake in Moscow. How to find it: approximately 6 km from the MKAD on the Dmitrovskoye Highway–MRP Yacht Club, or 300 m from the Vodniki platform in the direction of Savelovo.